The article might be a little difficult to read on your iPhone; as a result, I have included a link. This particular article has been around for a while; however, I just read it for the first time via my Instagram feed. I can’t stop thinking about Rosemond’s sage words. In fact, I had to read it twice to let the information sink into my brain, and I had to read it two more times before I decided to spotlight it in my blog. I was born to parents who believed what Rosemond wrote; as a result, my husband and I consciously decided to follow their lead and rear our children with this as a foundation. Yes . 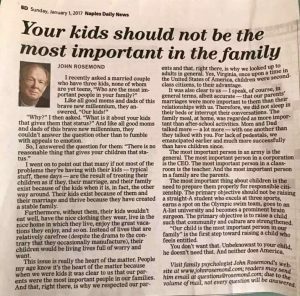 . . our children were very important to us. Yes . . we were dedicated to making their lives comfortable, safe and happy. Yes . . . they were very active in the academic, music and athletic arenas and . . . yes . . . we rarely missed an event; consequently, our calendar was packed, and we were often over-scheduled to the point of exhaustion. However, our children did not run our lives – we guided theirs. It was this final comment that motivated an elderly gentleman to speak for the first time. I did not recognize the man nor do I remember his name; however, his insightful words echoed inside of my head for the remainder of my child rearing years. Everyone was quiet for approximately three seconds as they processed his declaration. Then, they blew him off. He quietly walked away. “Are you kidding?” The women clamored. “What does being a good citizen have to do with anything regarding parenting?” Others agreed, “We want our children to be successful, top of the class, all-star athletes, stellar leaders, talented musicians and receive college scholarships.” I wondered – privately – if, perhaps, we all believed our children’s accomplishments were a reflection upon us. I may not remember that fellow’s name, but I have never forgotten his wisdom. From that day forward, I made a conscious effort to keep that stranger’s judicious statement in the forefront of my day. It resonated with me. After several decades, Rosemond’s article brought it back to the surface. The parenting journey isn’t about how successful your child is while he or she is living under your roof – instead, it is about laying the groundwork for your child to be independent, self-motivated, and a productive member of society because once your child is launched from the security of your home, it is up to him or her to find his or her way in life, to be productive and to give back to society — or in other words – to be a good citizen.